The Routledge Course in Mandarin Chinese is a two-year undergraduate course for students with no prior background in Chinese study. Designed to build a strong foundation in both the spoken and written language it develops all the basic skills such as pronunciation, character writing, word use and structures, while placing strong emphasis on the development of communicative skills. The complete course consists of Textbook Level 1, Workbook level 1 - including free CDs, Textbook level 2 and workbook level 2 -including free CDs. 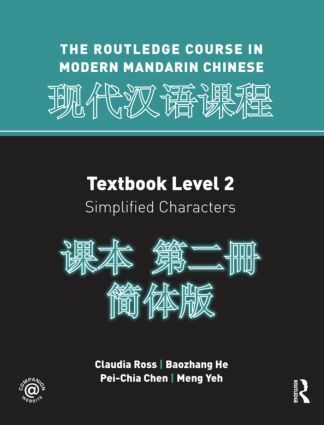 All books are available separately in simplified as well as traditional characters and take the students from complete beginner to post-intermediate level. Textbook Level 2 incorporates the innovative features of Level 1 including the separation of vocabulary from characters, a "basic to complex" introduction of grammatical structures, a comprehensive companion workbook with extensive practice in all language skills and functions, and a Teachers’ Manual. Model narratives that introduce formal written Chinese with explanations of the features of each narrative. Focus on narrative function including description, comparison, explanation, persuasion, and hypothesis. Reading and writing assignments that guide students to internalize model structures, to read for information, and to compose original essays for specific purposes. The course is also fully supported by an interactive companion website which contains a wealth of additional resources for both teachers and students. Teachers will find lesson plans in both English and Mandarin, providing a weekly schedule and overall syllabus for fall and spring, as well as activities for each lesson and answer keys. Students will be able to access downloadable character practice worksheets along with interactive pronunciation, vocabulary and character practice exercises. All the audio material necessary for the course is also available online and conveniently linked on screen to the relevant exercises for ease-of-use.